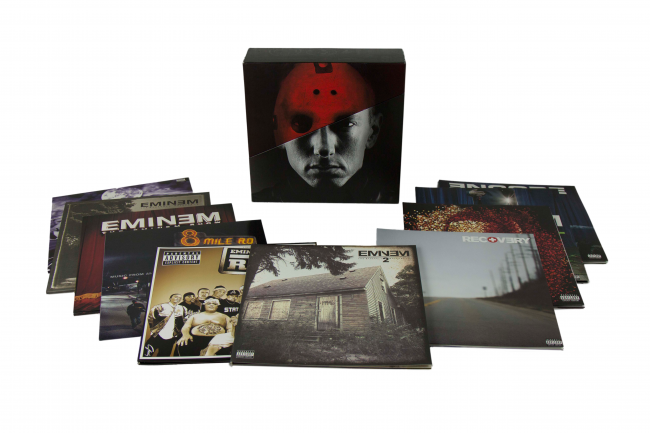 Marshall Bruce Mathers III, or better known as Eminem, has got his fans excited with the release of his limited edition discography box set. The set contains a compilation of 10 of his studio albums, starting from 1999 to 2013, plus the “8 Mile” soundtrack and the 2006 Shady Records compilation, "The Re-Up". The "Not Afraid" rapper's limited edition box set which retails at USD260 (RM965.50), has a pretty interesting box art too, as it features the rapper with his face half-shielded by a red hockey mask. The 42-year-old rapper first rose to mainstream popularity in 1999 when his second album "The Slim Shady LP" became successful.